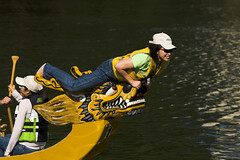 This morning Whirl and I took the El down to Chinatown to watch the Dragon Boat Races off Ping Tom Park. This was the ninth year for the Race. It’s presented by the Chinatown Chamber of Commerce in cooperation with the City of Chicago and the Chicago Park District. We’ve never attended them before. It’s quite an event, and I had a fun time trying to capture some of the excitement with photographs. I had a number of questions about the sport, how the tournament is structured. What the rules are. And several of the spectators were more than happy to explain what was happening. 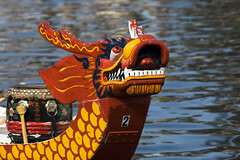 While most of the teams competing today were company teams put together to raise money for Chicago Public Schools’ Office of Culture and Diversity, I was intrigued to learn that there are professional Dragon Boat teams. And when we saw a couple of these teams take to the river, the difference in skill and technique was easy to discern. They knew what they were doing and were serious about doing it.